The golden-winged cacique (Cacicus chrysopterus) belongs to the family of cowbirds, oropendolas and caciques, the Icteridae. The golden-winged cacique is distributed over Argentina, Paraguay, Uruguay, Bolivia and Brazil in South America. 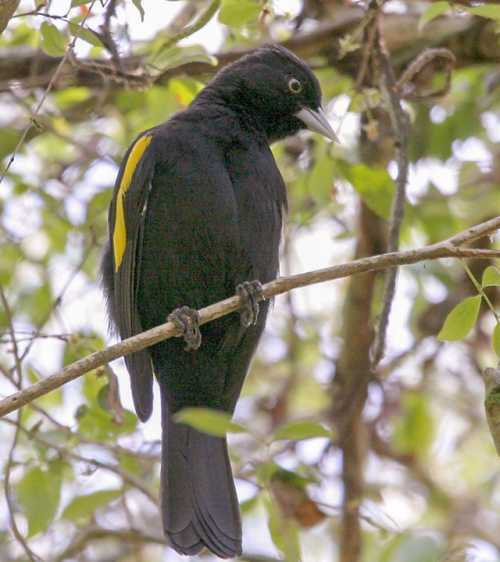 These cacique species have overall black plumage with bright yellow wing patch. These caciques are monotypic species. The golden-winged cacique (Cacicus chrysopterus) is a medium-sized cacique, measuring 19 to 21 cm in length and weighing 30 to 47 grams. The males are slightly larger. The golden-winged cacique has overall slightly glossy, black plumage. There is a bright yellow patch on the folded wing and the lower rump. The tail is slightly notched. There is a small black crest on the crown. The bill is conical, sharp and pale gray in color. The short legs and feet are blackish. The irises are blackish. There is a whitish eye-ring. Their call is a varying, low-pitched, musical sound. The golden-winged cacique is distributed over Argentina, Paraguay, Uruguay, Bolivia and Brazil in South America. 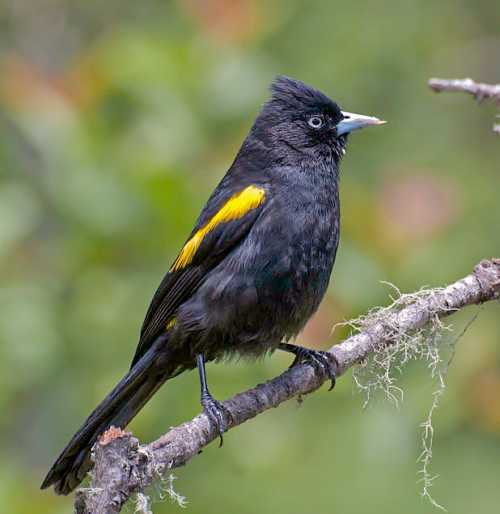 These golden-winged cacique species have moderate forest dependence. They normally occurs in altitudes between 0 to 2000 meters. The natural ecosystems and habitats of these species include tropical and subtropical dry forests, tropical and subtropical moist lowland forests and tropical and subtropical moist montane forests. 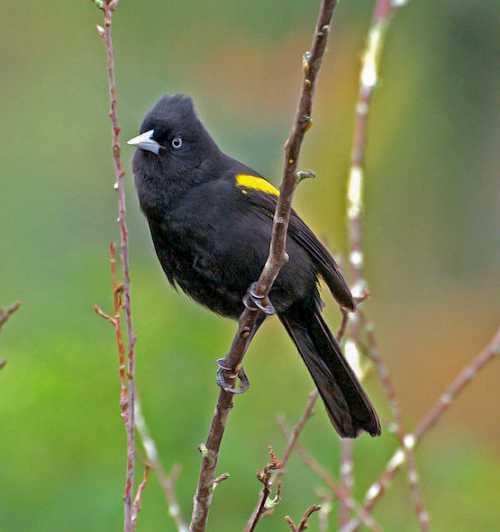 The diet of these golden-winged cacique species consists mainly of invertebrates. Insects, beetles, small vertebrates, fruits, berries and nectar are their primary food. The breeding season of these species is from October to December in Argentina. They are monogamous and solitary nesters. Their nest is a long hanging basket. The nest is built by the female. These cacique species are non-migratory, resident birds. The populations in higher altitudes may descent to lower altitudes in winter months. Post breeding, the juveniles may disperse and establish in new locations within the range. They may make local movements within their range for feeding and breeding. The global population size of the golden-winged cacique (Cacicus chrysopterus) has not been quantified. The overall population trend of the species is reported to be stable. In most of its range, this species is reported to be 'fairly common' (Stotz et al. (1996). The generation length is 4.6 years. Its distribution size is about 2,980,000 sq.km. Ecosystem degradation, ecosystem conversion and trapping of adults and juveniles for pet-trade are the main threats that may endanger the survival of the cacique species. The golden-winged cacique (Cacicus chrysopterus) species does not approach the thresholds for being Vulnerable either under the range size criterion, or under the population trend criterion or under the population size criterion. The CITES (Convention on International Trade in Endangered Species of Wild Fauna and Flora) status is ‘Not Evaluated’ for the golden-winged cacique (Cacicus chrysopterus). The golden-winged cacique (Cacicus chrysopterus) is closely related to the solitary cacique (Cacicus solitarius). Recently updated and current topic in South American birds: Golden-winged cacique - Cacicus chrysopterus with images.